Our heavy-duty stair treads with grit strips are the perfect solution when you need slip-resistant flooring that is safe and attractive. This slate grey stair tread has a grit strip inlaid in the tread that is 2” wide, offering additional safety and secure footing. Our heavy-duty stair treads are resistant to soil and stains, making them easy to clean and maintain. Sure-Foot is an industry leader in safety, so we understand that anti-slip flooring can be a big help in reducing fall risks. All our stair treads exceed ADA recommendations for slip resistance. 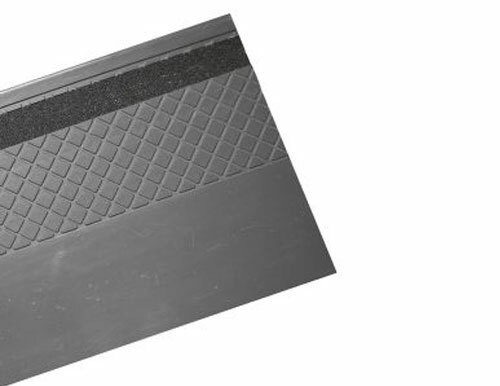 These heavy-duty treads are great for industrial, commercial and institutional buildings. For more information on our heavy-duty stair treads or to learn more about our anti-slip flooring solutions contact us or request a product sample today!